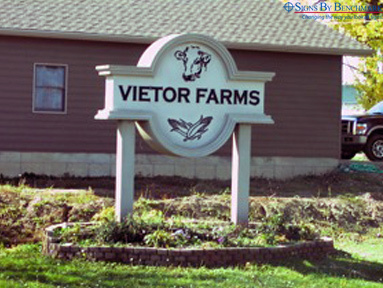 Standing proudly at 11′ wide x 11.7′ high by 26″ deep, this one-sided pylon sign personifies Vietor Farms’ cream of the crop. Designed with clean, classic lines, the sign’s message is “brought to life” by embossed graphics that represent the farm’s major products – corn and beef. Created by Signs By Benchmark, this sign represents a line of business outside the norm of “Downtown” industry. It reminds us that alternating focus between town and country can enlarge a sign shop’s profitable customer base. 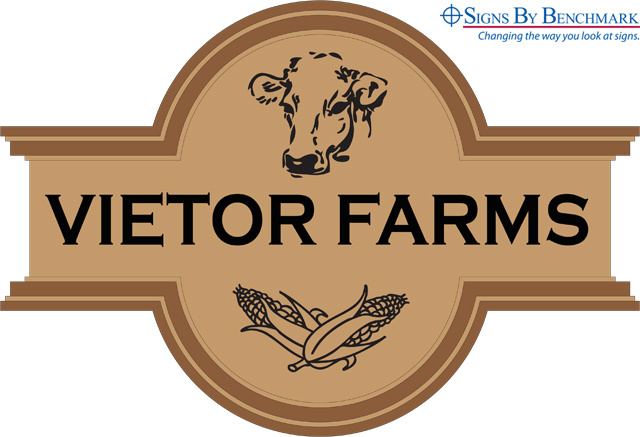 Collaborate with Signs By Benchmark on all your town and country sign projects. Provide your own designs or ask the team’s talented designers to assist. Call Signs By Benchmark today at 800-658-3444. Click here to view videos displaying how Signs By Benchmark products are created.